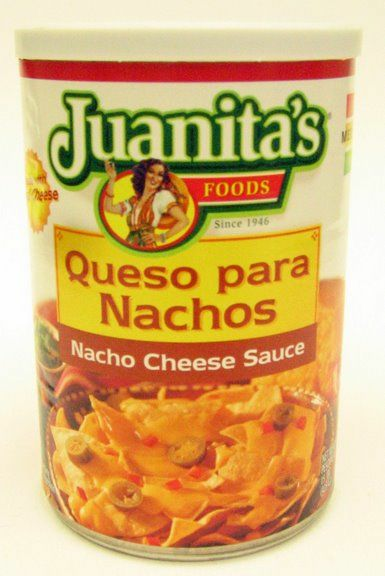 Nacho Cheese Sauce by Juanita's Juanita's Mexican Gourmet Nacho Cheese Sauce will help you make a fiesta out of any party! Prepared with real cheese and jalape�o puree, Juanita's Mexican Gourmet Nacho Cheese Sauce is delicious on tortilla chips for nachos and as a topping wherever melted cheese is called for! Savor the flavor of Mexico! Ingredients: Cheese, Whey, Partially Hydrogenerated Soybean Oil, Modified Food Starch, Cheddar Cheese (Cultured Milk, Salt and Enzymes), Tomato paste, Jalape�o Puree, Sodium Phosphate, Salt, Vinegar, Monosodium Glutamate, Onions, Natural Flavors, Mono & Diglycerides, Sodium Stearoyl Lactylate, Spices, Color added (Including FD&C Yellow 5 and FD&C Yellow 6). El queso para nachos de Juanitas Mexican Gourmet le ayudar� a crear una fiesta en cualquier ocasi�n. Elaborado con queso natural y pur� de jalape�os, el queso para nachos de Juanita's Mexican Gourmet es delicioso con totopos y como queso derretido o fundido.